The three Democrat candidates, Bernie Sanders (left), Hillary Clinton (center) and Martin O'Malley (right), take the stage before the start of the keynote speeches. DES MOINES, Iowa — Saturday, Oct. 24 marked not only the annual Jefferson-Jackson (JJ) Dinner at Hy-Vee Hall for Democratic presidential candidates. It also marked exactly 100 days until the Iowa caucus. On the day of the dinner event, all three Democratic candidates held rallies early in the day to get voters riled up and ready for the dinner, which is said to be a possible turning point for the candidates. Former Maryland Gov. Martin O’Malley personally serenaded his supporters at a rally outside of Veteran’s Memorial Auditorium, a block away from where the JJ Dinner was to be held. Vermont Sen. Bernie Sanders was across the river, gathering supporters to march across the bridge and up to the hall as a unified group. Meanwhile, the largest rally held was by former Secretary of State Hillary Clinton. The warmup before the main attraction, 42nd President Bill Clinton spoke to the crowd of more than 2,000. One of the topics he brought up was Hillary’s 11-hour testimony to the Benghazi Select Committee Hearing earlier that week. Those in attendance then marched together to Hy-Vee Hall to await the dinner. This year was the final year that it will be known as the “Jefferson-Jackson” Dinner, as the name will be changing due to the named presidents being known slaveholders. The JJ Dinner is known to be a pivotal moment in the election for the Democratic Party, particularly after current President Barack Obama’s performance in 2008 against Hillary Clinton. After performing well in the caucus state, Obama went on to win the Democratic nomination and was elected for two terms as president. After beginning an hour behind schedule, the program began as the Des Moines Gay Men’s Chorus sang the national anthem. After Iowa Democratic Party Chair Andy McGuire gave opening remarks and introduced the candidates, Sanders was the first to take the stage. Sanders, who usually speaks behind a podium, was faced with a test as the JJ Dinner is held “in the round,” meaning that the stage is encircled by the audience. Sanders, however, rose to the challenge and delivered an impromptu five-minute speech criticizing the Republicans before beginning his prepared remarks. Along with criticizing the Republicans, Sanders also alluded to the inconsistencies in Hillary’s voting record by bringing up the Defense of Marriage Act in 1996. After Sanders was finished, O’Malley took to the stage to hopefully sway more voters his way, as he is often polling in the single digits. Rather than directly calling out his opponents, O’Malley asked that the three candidates be on the same terms when it comes to gun safety laws. 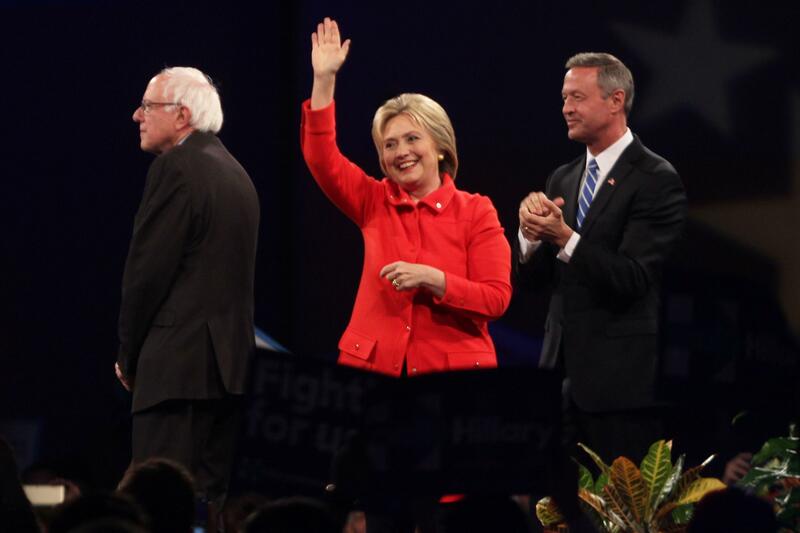 O’Malley also acknowledged that he is currently looked at as the contender behind both Hillary and Sanders. To end the night, the former Secretary of State made her way to the stage as the her supporters lit up the room with their blue glow sticks. Hillary wanted to make her reason for running very clear to the voters. Unlike her opponents, Hillary brought up the issues with women’s reproductive rights. “Republicans sure love using government to step in and make decisions for women about our bodies and our rights,” Clinton said. Her public supporter, Katy Perry, was also at the dinner, sitting close to the stage and cheering whenever Hillary said something she agreed with. With the growing rivalry and shrinking difference in polling numbers, the race for the Democratic presidential nomination gets closer and closer. Vermont Sen. Bernie Sanders speaks at the Jefferson-Jackson Dinner on Saturday. Democrat Sen. Bernie Sanders of Vermont leads the Democratic candidates in number of people coming to hear him speak and leads with the number of individual campaign donors, and at the Jefferson-Jackson Dinner Saturday night, Sanders had the loudest supporter section in attendance. 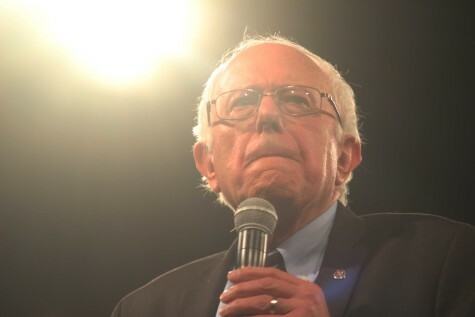 Sanders spoke on his record of standing up for his principles while serving as senator for Vermont and for his stance on not discriminating against segment of the U.S. population. Sanders discussed the problem of income inequality and what his plans are to reverse the trend of the shrinking middle class. Sanders also discussed the unemployment issues and what can be done to employ Americans while also working on U.S. interests. Like the other candidates, Sanders discussed climate change and criticized the Republican candidates’ refusal to recognize the problem. Sanders also discussed his plan to switch the country’s dependence on fossil fuels to cleaner energy. “While many in the Republican Party continue to deny the reality of climate change, you have demanded that we lead the international community in transforming our energy system away from fossil fuels to energy efficiency and sustainable energy. And you understand the moral imperative that we leave this country in a way that is healthy for our children and grandchildren. Sanders ended his keynote by reiterating his political agenda. Former Maryland Gov. Martin O’Malley speaks second during the keynote portion of the Jefferson-Jackson Dinner. While Democratic candidates Sen. Bernie Sanders and former Secretary of State Hillary Clinton lead the polls by a substantial margin not only in Iowa, but across the United States, former Maryland Gov. Martin O’Malley tried his best to send a message at the Jefferson-Jackson Dinner: His experience and record working in the executive branch of government is worth voter’s attention. “All of us here tonight agree that we cannot allow Donald Trump or any of the Trump-wannabes in this year’s Republican field to take over the White House,” O’Malley said. O’Malley also touched on dealing with the banks and the “bullies of Wall Street.” O’Malley believes the banks should be broken up in order to prevent another financial crisis like in 2008. “If a bank is too big to fail, too big to jail, and too big to manage, then it’s too damn big, and it needs to be broken up before it breaks our national economy once again,” O’Malley said. 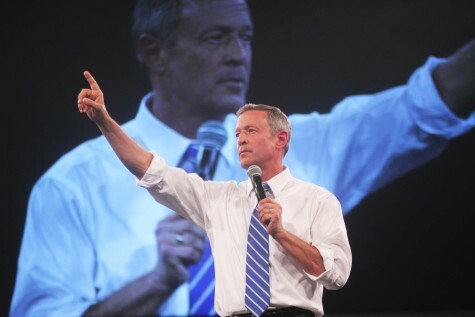 O’Malley directed a large portion of his second half of the keynote discussing the National Rifle Association (NRA) and gun crimes in the U.S.
“We must have the courage to put our children’s safety, each and every day, ahead of the craven and morally bankrupt interests of the National Rifle Association,” O’Malley said. “The NRA has one goal and one goal only; selling as many guns as possible, no matter the cost in lives. Well that might be their interest, but that is not what is best for America. O’Malley finished his keynote by summing up his reason for running. Former Secretary of State Hillary Clinton speaks last at the Jefferson-Jackson Dinner. 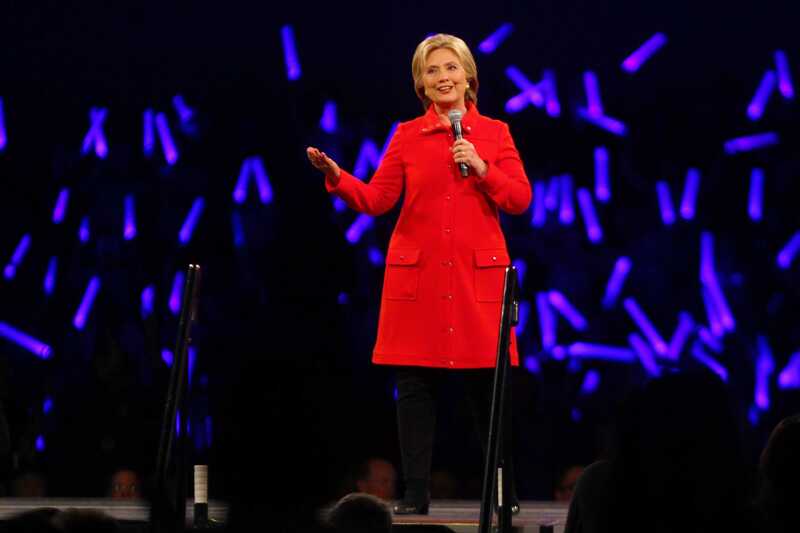 As former Secretary of State Hillary Clinton took to the stage as the final speaker of the event, her supporters erupted in the chants “I’m with her,” and “Hill yes,” while waving bright blue glow sticks. Clinton censured her Republican counterparts throughout her entire speech, at one point accusing the party of ignoring scientific facts. Clinton also spoke out against Republican efforts to defund Planned Parenthood, a non-profit organization dedicated to supplying men and women with reproductive health services. Another prominent issue in Clinton’s speech was the current debate about gun safety laws. “You should be safe when you go to school, when you go to the movies, when you go to church,” Clinton said. “That’s why I’m proposing common gun safety measures like universal background checks, closing the loopholes that let guns fall into the hands of those who shouldn’t have them and repealing that law that shields gun makers and sellers from accountability. Clinton also directly criticized Republican frontrunner Donald Trump’s campaign slogan and used it as a platform to portray her plan to raise the federal minimum wage and reduce tax breaks for the upper class. “So I hear Donald Trump when he says we have to ‘Make America great again,’” Clinton said. “Well here’s what I say: America is great. We just have to make it fair and just. We have to make America work for everyone, not just those at the top. Clinton also spoke about her influences for running for office: her parents and grandparents. Clinton explained that people like her parents are who she strives to help.